We’ve shared with you Em’s pixie party. Now, here’s how it all came together! As we mentioned, we decided not to have the party at our house this year. Instead, we rented out a place called Gorgeous Millie and invited all of Em’s classmates and a few friends from her dancing class. 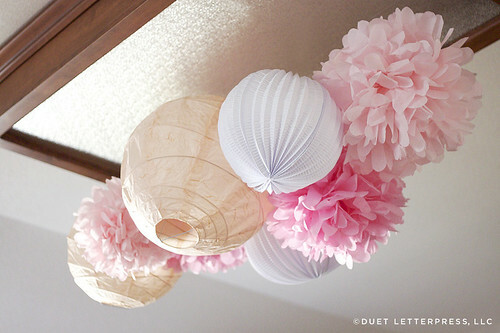 Since the space was already so lovely, we kept decorations very simple + minimal. I ordered 3 huge balloons from here. 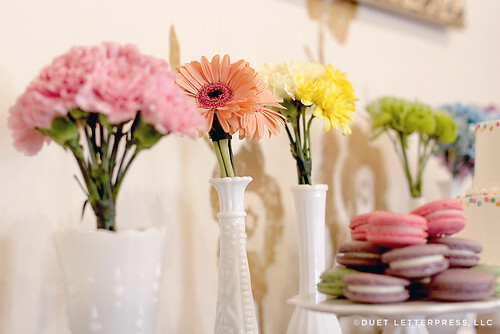 The white vases were a mix of from Ikea and Goodwill. Like previous years, I just picked up flowers the day before the party at a local grocery store and put them together. 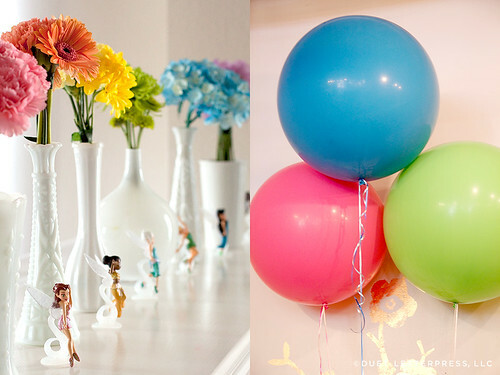 To follow the rainbow theme, I made sure to get flowers in all of these colors – pink, orange, yellow, green, blue and purple. 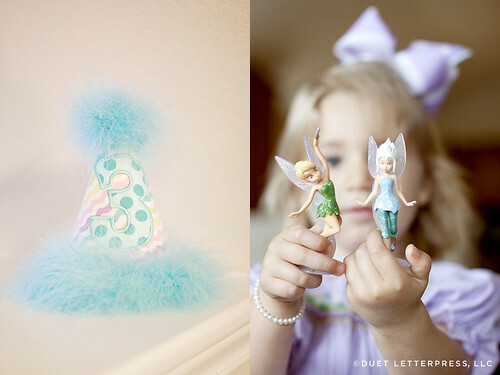 The glittery little fairies are from The Disney Store. The birthday cake came from Whole Foods. 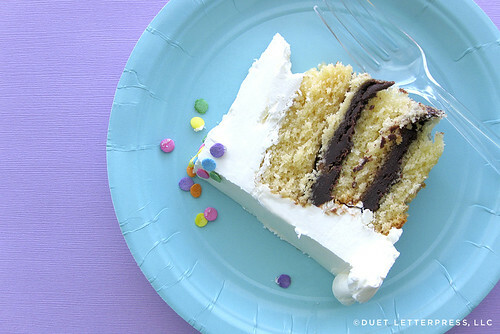 It had layers of chocolate ganache on the inside and we asked for the outside to be completely white. 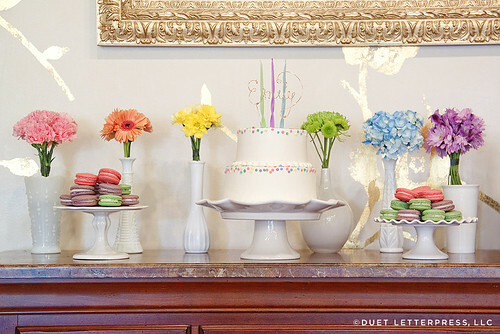 At home, I decorated it with multicolored sprinkles I found in the Easter aisle at Target. These are the twisted candles we used. 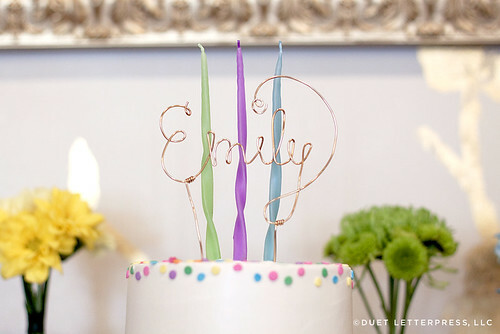 For the cake topper, I made her name out of the heaviest gold wire I could find from the craft store. 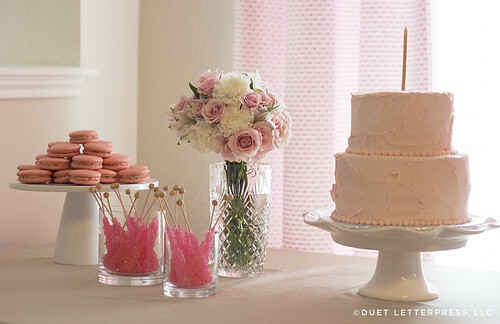 Just like the previous two years, we picked up tasty macarons from a local bakery called La Pâtisserie. In addition to the macarons + cake, we picked up a fruit tray and a couple of sandwich trays from a local grocery store. We wanted to keep the food simple and easy. 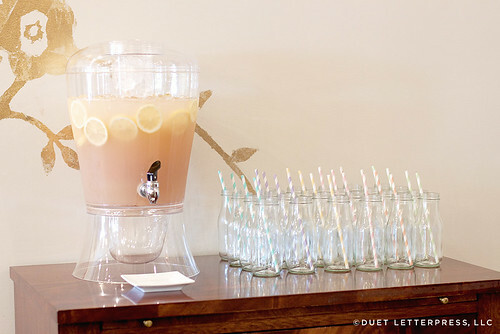 We offered water and lemonade to the guests. For the lemonade, we used organic lemonade we picked up from Central Market and infused it with strawberries and lemon slices. 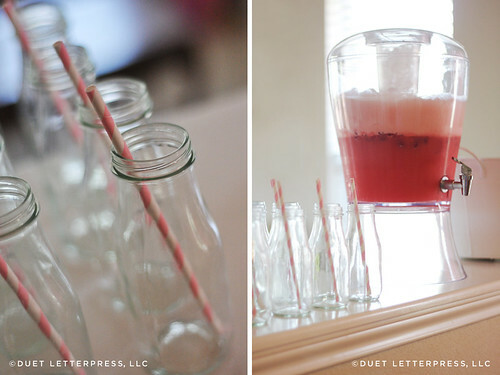 This is the drink dispenser we used. It holds 3 gallons and we had to refill it during the party. The glass bottles are actually Starbucks coffee drink bottles . We’ve used them the last two years so peeling off all those labels was an excellent investment time-wise! 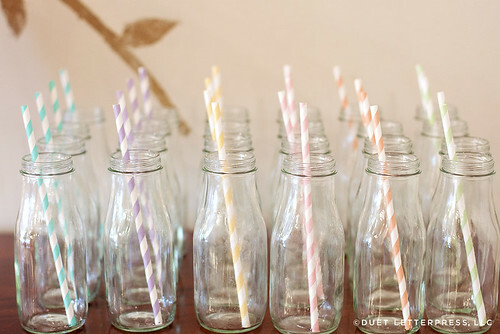 I ordered the striped paper straws from two different Etsy shops – here and here. 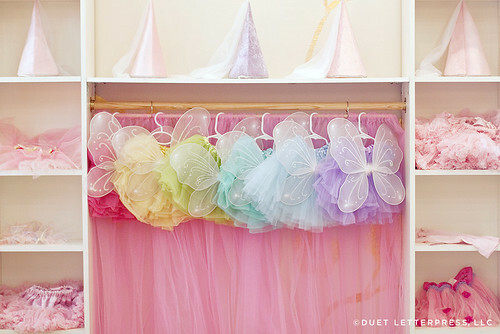 The party space, Gorgeous Millie, provided lots of dress up clothes options including hats, princess dresses and a few colorful fairy wings. 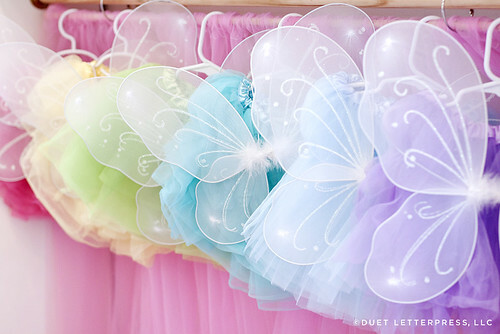 We also brought additional tutus + white fairy wings for the children. 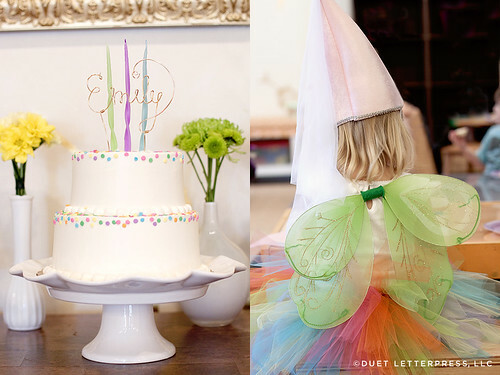 Em’s custom party hat came from the same Etsy seller we used last year. 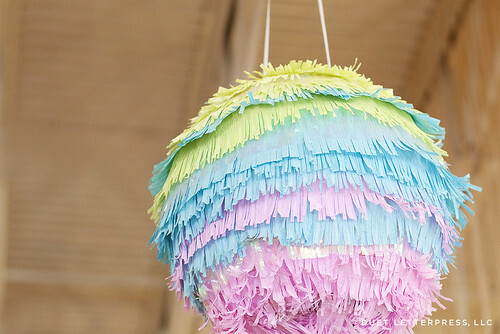 Instead of buying a piñata, I tried my hand at making one using these instructions + these instructions. I wish I would have taken more time on it and added more layers. This is where I bought the crepe paper. 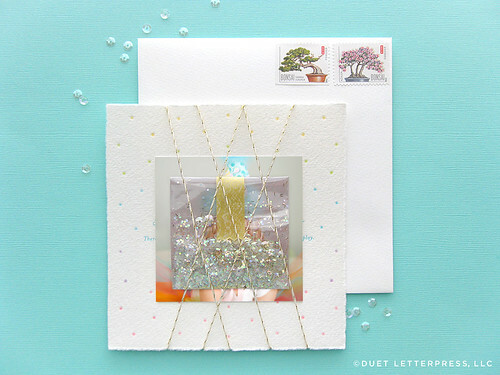 I also added iridescent mylar sheets that I picked up in the gift wrapping aisle at a party store. If you’re going to make one, I highly recommend getting these fringe scissors . I added a removable bottom which I fastened out of cardboard since I filled the piñata with heavy party favors instead of confetti. I poked holes through the cardboard bottom and strung through pull stings made from iridescent curling ribbon. 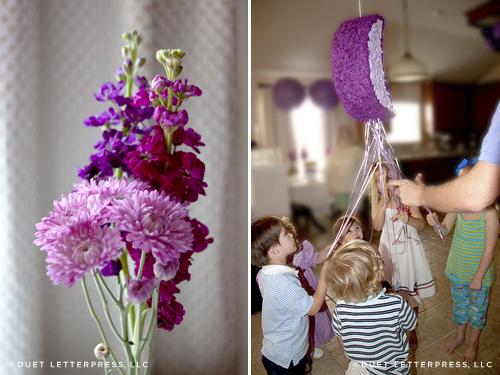 One strand of ribbon was tied securely and was the one that opened up the piñata. The favors all came from Party City with the exception of the poppers that I bought online which turned out to be duds and rainbow circle stickers I found at Target. 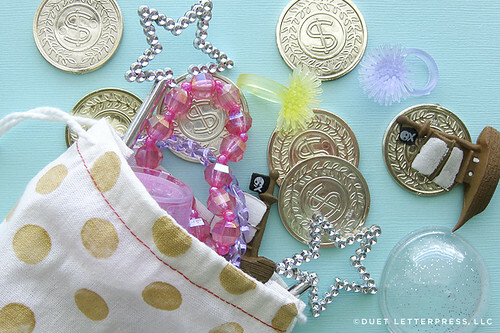 The kids gathered all of their goodies in super cute gold polka dot muslin bags I found on Etsy. And, there you have it! The makings of Em’s third birthday party. 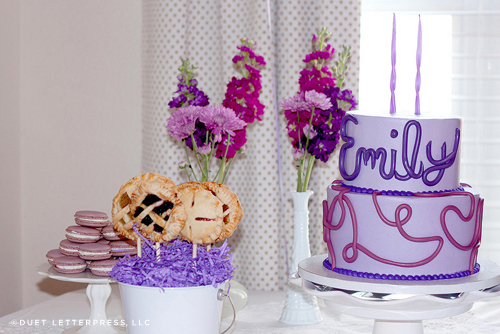 A few weeks ago, we celebrated Em’s third birthday with a pixie party! 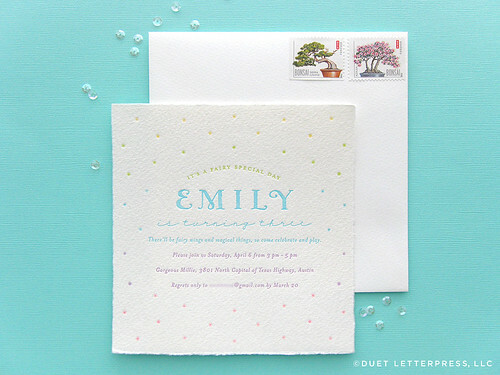 You’ve seen the letterpress printed invites we sent out. Now it’s time for us to share her party with you! Em loves Tinkerbell and all of her friends. 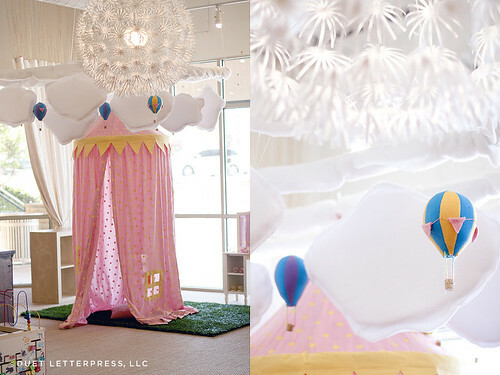 So, we decided on a loose fairy/pixie theme for her party this year. 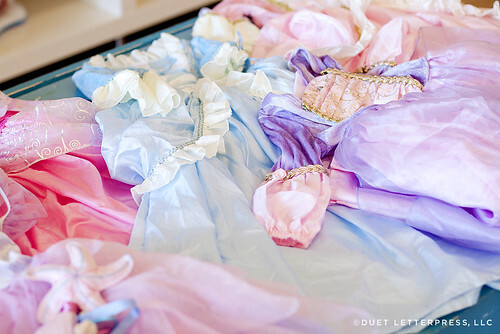 And, after noticing that the Disney fairies combined make up the colors of the rainbow, I knew we had found our color palette for her party. We rented out a space for her party and invited all of Em’s classmates and a few friends from her dancing class. The place we chose is actually a space for co-op playgroups. It turned out to be a great choice. Not only was the facility gorgeous, it was fully set up for kids under the age of four. 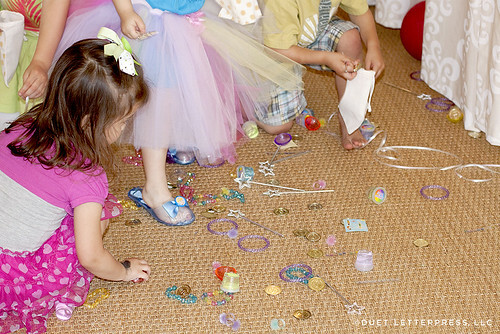 There were different areas for the kids to do all sorts of things like play dress up which they loved! As promised, there were fairy wings for all of the children to put on. including pirate ships + gold doubloons. 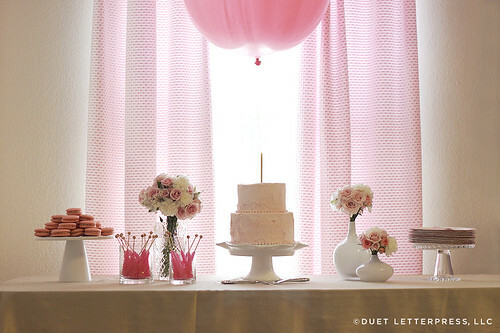 Her pixie party was a big success and so much fun to plan! 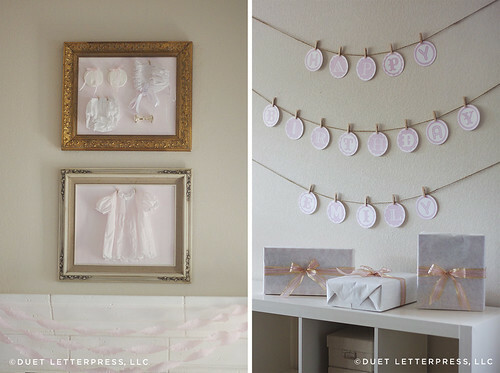 A hearty thank you to everyone who came to her party + celebrated with us. We’re so lucky to have you in our lives! 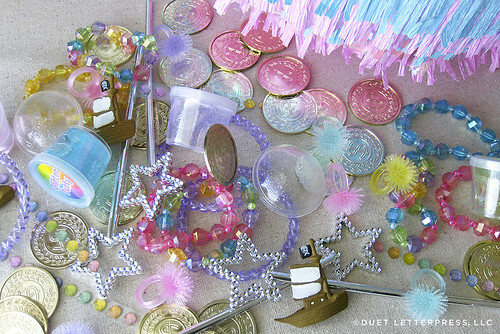 I plan to do a follow up post featuring links on where we got everything to make her pixie party come together. 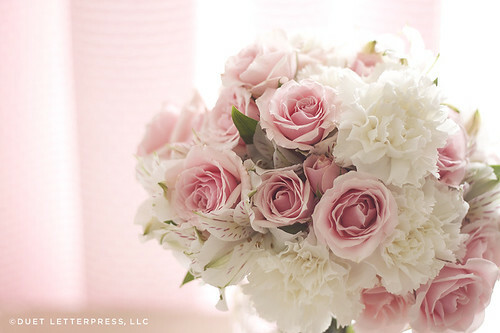 If there is anything you are curious about, please leave a comment! 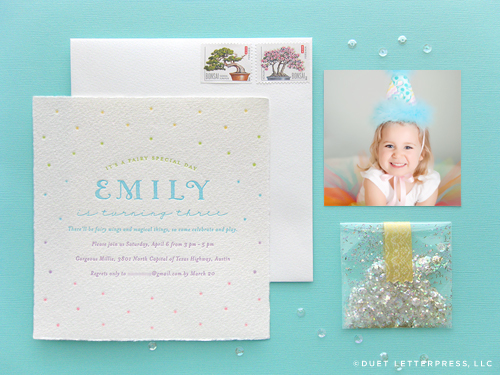 Today, I’m happy to share with you the invitations we designed + letterpress printed for our daughter’s third birthday party. After lots of thought, we decided to throw Em a pixie party! Like her first two birthday invites, I wanted to include a picture of the birthday girl and a little something fun for each recipient. So, in keeping with the theme, I mixed up some magical pixie dust and sprinkled it inside a little washi taped clear envelope. 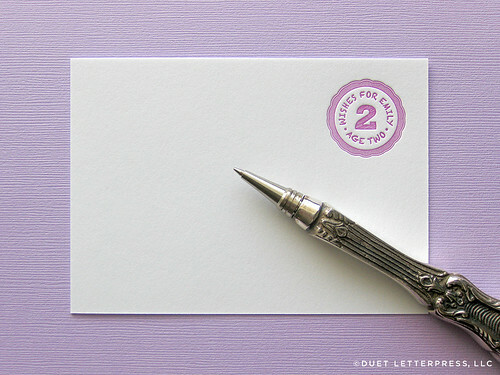 and letterpress printed five colors on each invite. If you look closely, you can see a rainbow of yellow, green, blue, purple + pink. 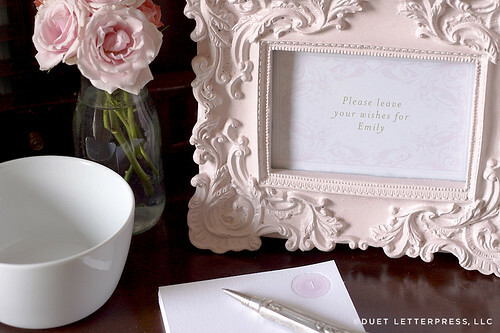 The invite, pixie dust and picture were all bound together with cream + gold twine. 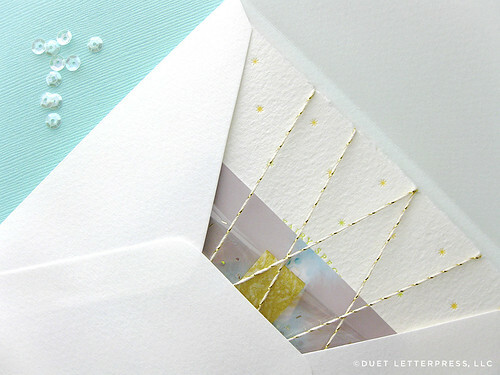 And the pieces all nestled inside a square envelope. So, here they are. 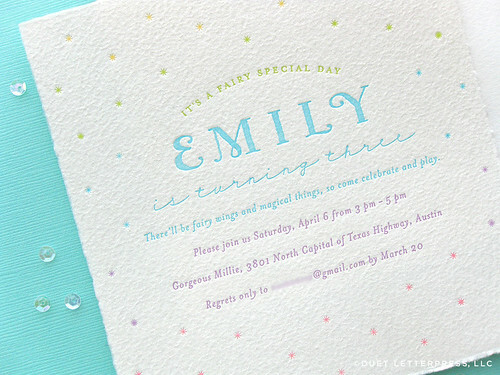 Em’s fairy special third birthday party invitations for her pixie party! The first weekend of April, our sweet Em turned 3! 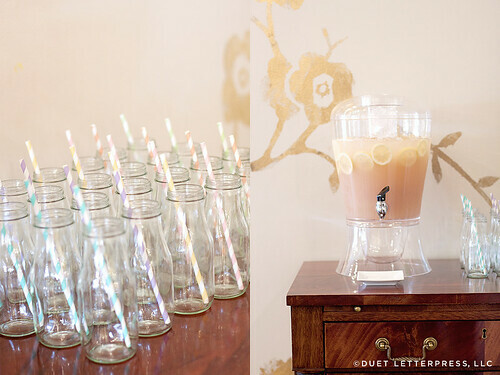 We’ve got lots of pics from her party to sort + edit. 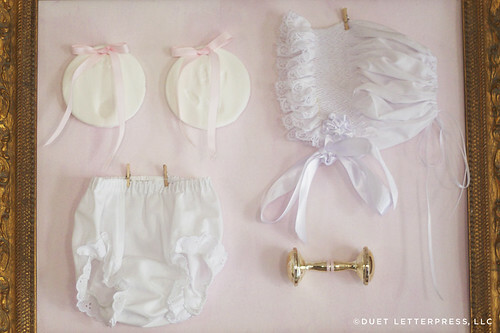 In the meantime, here is a little sneak peek of her invitations. If you follow us on Twitter or Facebook, this is the five color job that we accomplished! 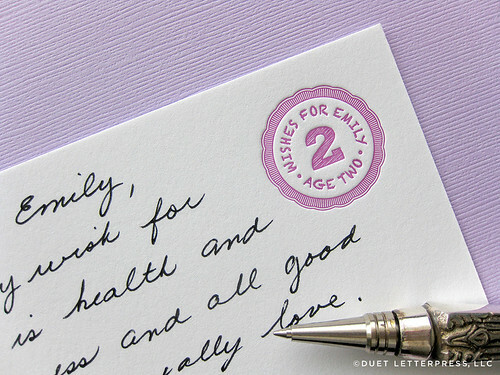 Like last year, we handed out letterpress printed wish cards for Em’s second birthday party. Guests wrote down their words + wishes for Em. And like last year, after the party, we really enjoyed reading them and tucked the cards into Em’s memory box for safekeeping. We shared with you Em’s second birthday party invitations. Now, it’s time to share her party with you! 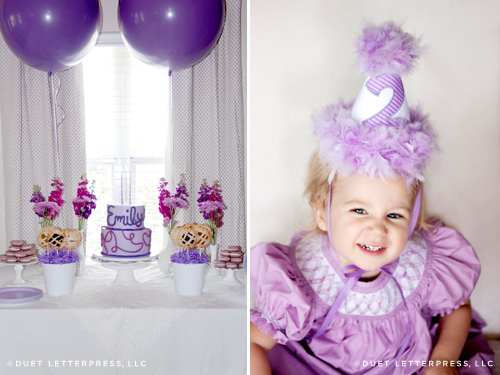 In keeping with the Emily and the Purple Crayon theme, there was lots of purple. 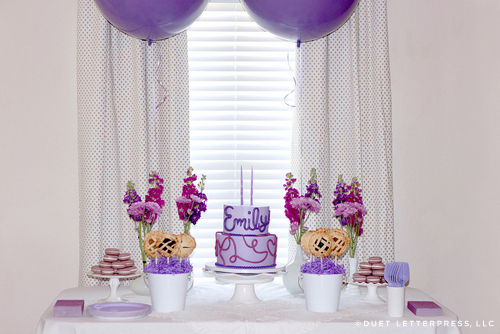 We hung two huge lilac balloons behind the dessert table. 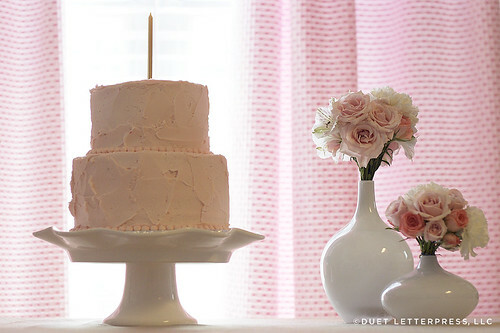 We ordered a two tier cake from Polkadots Cupcake Factory. 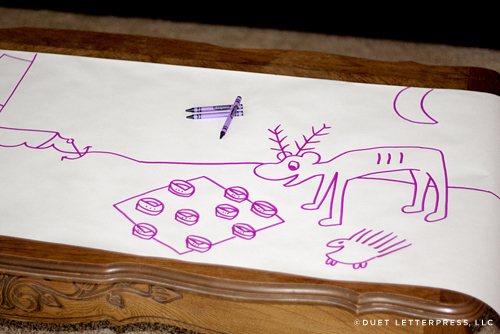 The bottom layer mimicked purple crayon scribble. 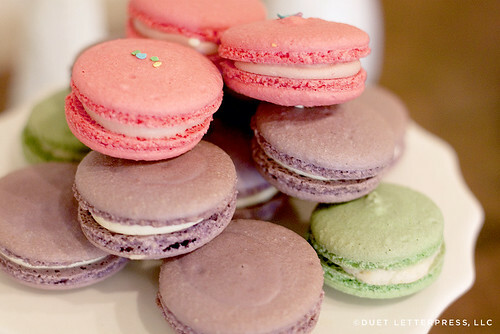 There were purple macarons from La Pâtisserie. And, there was pie. Lots of pie. There were all nine kinds of pie pops that Emily loved best. Her fabulous party hat was custom made from Dainty Couture. We reused the Starbucks bottles from her first birthday party. 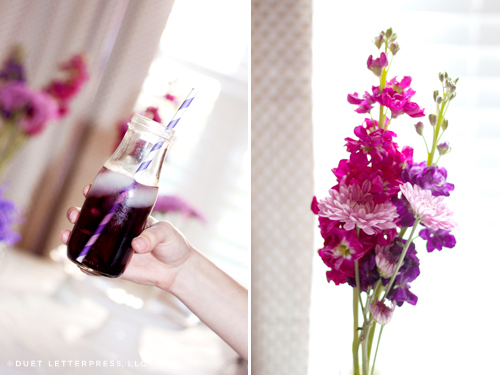 And, after many, many unsuccessful tries, we finally found the perfect purple drink and popped in purple straws. I picked up several purple, lavender + magenta flowers from a local grocery store and arranged them in white vases we either already owned or we had thrifted. For the decor, I sketched a similar scene from the book and framed it. 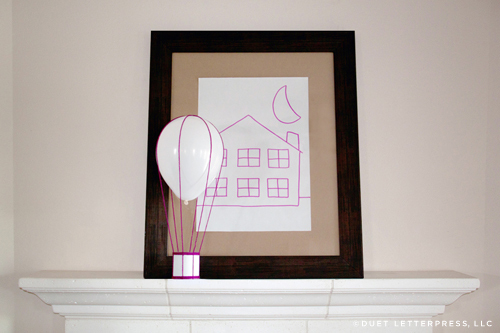 To add a little 3-D element, we fashioned the hot air balloon from magenta yarn and a spray painted kraft container. In other areas around the house, we hung Em’s monthly pictures and an art piece Em drew using multiple shades of purple crayons. 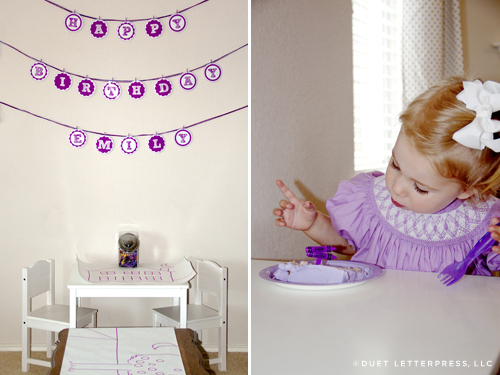 We also hung a happy birthday banner that we revised to fit her color theme. In a kitchen drawer, my cousin happened to find a vintage cupcake topper with two purple crayons on it. Fate, right?! We used it for Em’s slice of cake. For the kids, there was lots of coloring. On a long roll of white butcher paper, I drew out several scenes for them to color. We also played the Pilot episode of Harold and the Purple Crayon on the tv for the kids to watch. There was also a purple moon pull string piñata filled with purple crayon erasers, purple bubbles, purple bracelets, purple dinosaurs, purple frogs and sparkly purple stickers. All in all, the party was a success! 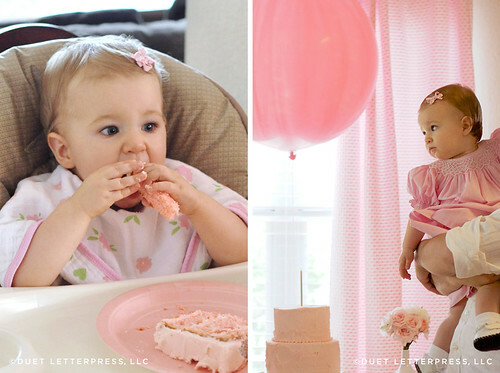 A big thank you to everyone who came to her party + celebrated with us. Em is a lucky little girl to have you all in her life!